Oceans cover more than 70% of the Earth’s surface and play a crucial role in determining weather, stabilising planetary temperature and regulating the atmosphere. Life would not be possible without our oceans. Coral reefs make up 0.1% of the Earth’s surface, and yet they are known to house as much as 25% of all marine biodiversity. Research shows that at the current rate of warming, coral reefs – which provide food, jobs and storm protection to several hundred million people – will disappear completely by 2050. More than simply warming marine waters, climate change is also inducing increased ocean acidity that will take generations to negate. In this the International Year of the Reef, rising sea levels, unsustainable fishing, global pollution and coastal development are all threatening the future of our coral reefs, and the resources they provide. 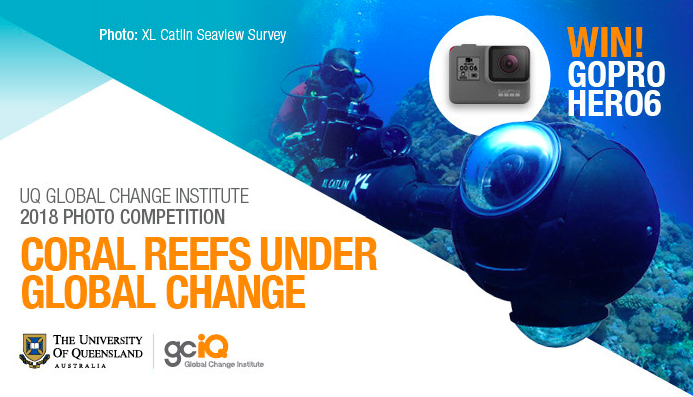 The UQ Global Change Institute is seeking images to illustrate the important message that the future of our coral reefs is at a crucial tipping point. To this end the GCI is part of the ambitious 50 Reefs project to protect the world’s 50 most strategically important coral reefs. Photo competition entries can be from an economic, social/cultural or environmental perspective and are not restricted to purely underwater images. Inspirational interpretations resulting from visits to coral reefs around the world are also welcome. Whether you’re a student, a serious photographer or simply looking for photographic inspiration – we would encourage you to enter. First prize is a GoPro HERO6 Black with battery/charger, action carry case and 32 GB microSDXC memory card, valued at AUS$730. After a winner has been chosen, a selection of the competition’s top entries will be displayed in the GCI’s Living Building at the St Lucia Campus of The University of Queensland. You may submit as many as three unpublished images taken during the past two years. You, the photographer, retain the copyright to your images. Entrants must be 18 years old or older as of Monday, 2 April 2018. Only digital photos accepted (see criteria set out in the Guidelines and How to Enter sections on entry form). Entries close Friday, 1 June 2018 (5.00 pm UTC+10:00 Brisbane). Winners will be announced on the GCI’s Facebook page Monday, 11 June 2018.